This project will identify the molecular ‘fingerprint’ and origin of Earth’s earliest carbon by reconstructing both the transfer of extraterrestrial carbon to the geological record and the alteration of terrestrial carbon during meteorite bombardment. These goals will be achieved through analysis of a suite of meteorites, samples from terrestrial impact craters, plus material from a series of laboratory hypervelocity impact experiments. 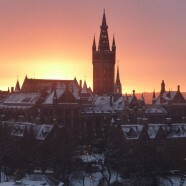 The student will combine ultra-high resolution isotopic and spectroscopic analytical techniques and expertise from the biomedical, geological and engineering sciences at Glasgow University in an entirely novel approach that will isolate and identify carbon compounds, and their alteration, in meteoritic and geological samples at unprecedented levels of precision and accuracy. Results will be assessed by multivariate analysis and intelligent data mining methods in order to investigate the origins of Earth’s earliest carbon cycle and the complex carbon forms essential for life. Answering these questions will transform our understanding of carbon in ‘Deep Time’ and will allow us exciting new insights into the environment of the Hadean and Achaean Earth, which, despite comprising over 50% of Earth’s history, remains its most poorly understood component.